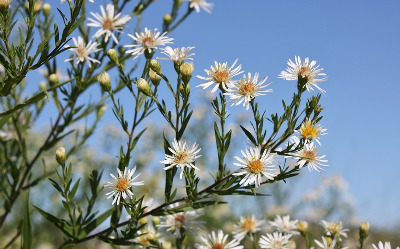 Aster pilosus of Michigan Flora. Two rather well-marked varieties are found in Michigan, although apparent intergrades rarely occur. Chiefly inland in the southern Lower Peninsula, with occasional plants in disturbed sites northward, is var. pilosum, with spreading hairs on stems and leaves. This somewhat weedy variety is in dry to wet fields and prairies, along roadsides and shores. Along and near the shores of the Great Lakes from Berrien and Huron Cos. north is var. pringlei (A. Gray) G. L. Nesom, with stems and leaves glabrous or nearly so. This is a calciphile, on sandy and gravelly shores and beaches, interdunal flats and swales, limestone pavements and other outcrops, rarely in fens (inland in Lenawee Co.); fields and streamsides. The bracts and leaves around the inflorescence often have spinulose tips; the awl-like appearance of these and the tips of the phyllaries make this a reasonably easy species to recognize. Rays are normally white, but rare pink forms are known. MICHIGAN FLORA ONLINE. A. A. Reznicek, E. G. Voss, & B. S. Walters. February 2011. University of Michigan. Web. April 21, 2019. https://michiganflora.net/species.aspx?id=490.